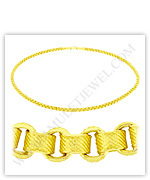 14 to 24 inches gold chain necklaces & more (box chains) in this category are ordered from low prices to high prices. You can simply click on the links or images below for more detail of each item. We offer you a 30 day return guarantee, a life time guarantee, and a low price guarantee for all items. We ship your items via FedEx, EMS, RMS with a shipping insurance option at low cost. 14 to 24 inch gold chains & more (box necklaces).